The Ltd. Ed. 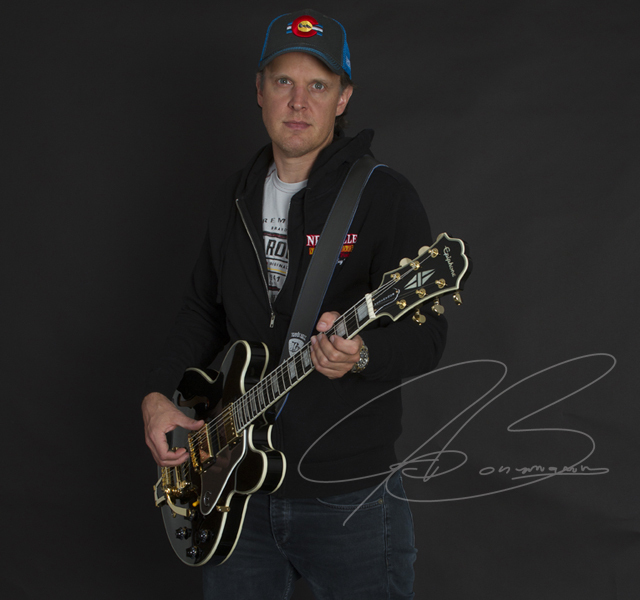 Joe Bonamassa ES-355 Standard Outfit is Epiphone’s sixth Signature model with GRAMMY® nominated blues legend and expert vintage collector Joe Bonamassa. Featuring the classic ES-355 semi-hollowbody archtop profile with an Ebony finish, gold hardware, ProBuckerTM humbuckers, Mallory Capacitors, a Bigsby™ B700 Vibrato and Vibramate® String Spoiler, Custom Hard Case, and Hand-Signed Certificate of Authenticity. Custom Hard Case and Hand-Signed Certificate of Authenticity. The new Epiphone Ltd. Ed. Joe Bonamassa ES-355 Standard Outfit has a 5-ply Maple top and body with a beautiful Ebony finish adorned with multi-layer white & black binding on the top, back, and on the Sloped Dovewing headstock. The Mahogany neck has 24.75” scale with a SlimTaper™-D profile with 22 medium jumbo frets. The Ebony fingerboard has pearloid block inlays and a 1.68” Graphtech® Nubone™ nut that is as hard as a traditional bone nut but longer lasting. The headstock has the "Epiphone" logo in Pearloid and the back of the headstock has a "Joe Bonamassa" signature reproduced in gold silkprint along with a "2018" Limited Edition logo. 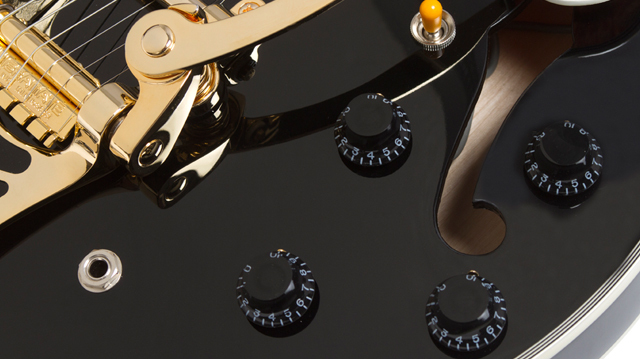 The tortoise shell-inspired pickguard has multi-layer binding and a metal “E” logo. The Ltd. Ed. Joe Bonamassa ES-355 Standard Outfit is powered by critically acclaimed ProBuckerTM humbuckers with gold covers and Alnico II magnets, the same pickups Joe chose for his Ltd. Ed. “Amos” Korina Flying “V” Outfit. The neck position has a ProBucker 2™ and the bridge position has a ProBucker 3™ that is slightly overwound to emulate the tone of 1950s-era hand wound “PAF style” humbuckers. 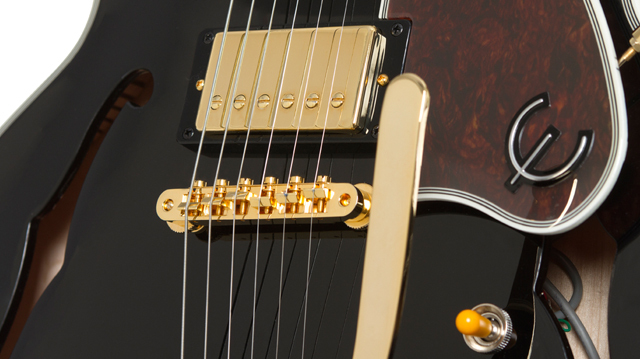 Controls for each pickup’s Volume and Tone come with Black "Top Hat" knobs with metal pointers and include world-class Mallory 150 Capacitors along with a Switchcraft® 3-Way Pickup Selector with an Amber Toggle Cap. Like all Epiphones, Joe Bonamassa’s Signature Ltd. Ed. 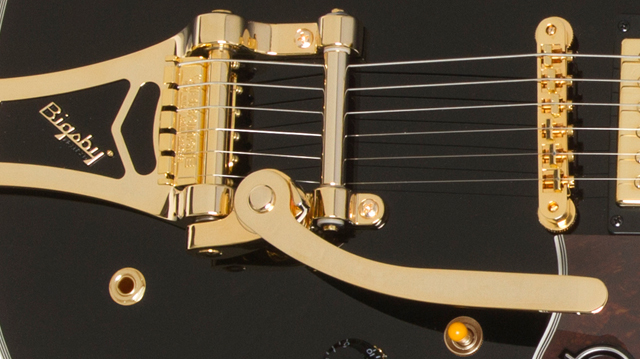 ES-355 features rock solid hardware including a gold ABR-1 LockTone™ Tune-o-matic bridge and a Bigsby™ B700 Vibrato tailpiece with a Vibramate® String Spoiler for quick string changes. Tuning is fast and accurate with Grover® Rotomatic machine heads with an 18:1 tuning ratio. 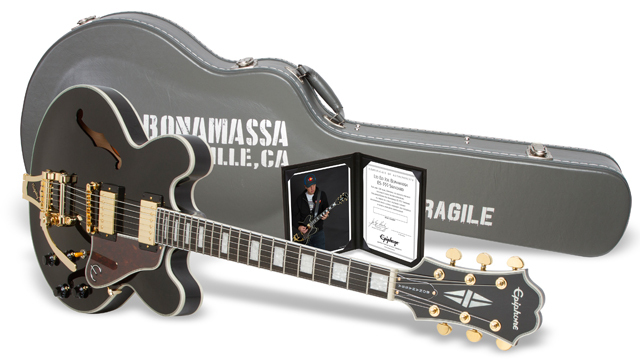 A stylish vintage-inspired hard case is included with Bonamassa’s logo and Nerdville, CA in classic Army-style typeface along with a hand-signed Certificate of Authenticity. The Ltd. Ed. Joe Bonamassa ES-355 Standard Outfit comes with Epiphone’s Limited Lifetime Warranty and world famous Gibson 365/24/7 Customer Service. The Ltd. Ed. Joe Bonamassa ES-355 Standard Outfit is available for a limited time only while supplies last. See your Authorized Epiphone Dealer for details today or visit Epiphone.com to find a dealer near you!